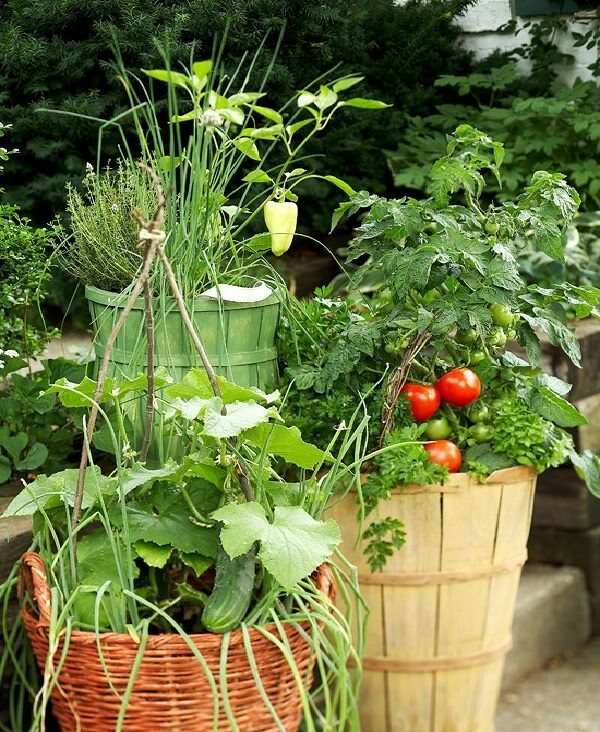 Growing vegetables in pots is an excellent idea if you have a limited space, starting your own container vegetable garden gives you a chance to produce a bountiful harvest of edibles that are freshest and tastiest! 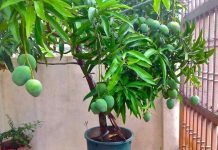 As you’re reading this article, you’ve already decided that growing vegetables in pots is something you should try. And you’re right; you can grow crops on a balcony, rooftop, patio, porch and even indoors on a windowsill. 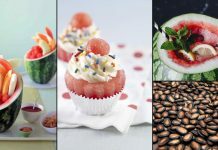 The possibilities are endless, and you can produce edibles in substantial amounts. Take a look at the space you’ve chosen to start container vegetable gardening! See up and down, left and right. Identify, the direction! A South facing or West facing (especially in cool climates) is best, and if your space is North facing, your options are very limited. Before beginning, observe the chosen space well for a day or two. Why? To calculate the hours of sunlight it gets, corners that receive more light and shady parts as well. Also, see if it is windy, humid or really cold. Jot down the details in a planner or notepad of your mobile to make a plan. Does your space receive at least 6 hours of direct sunlight? 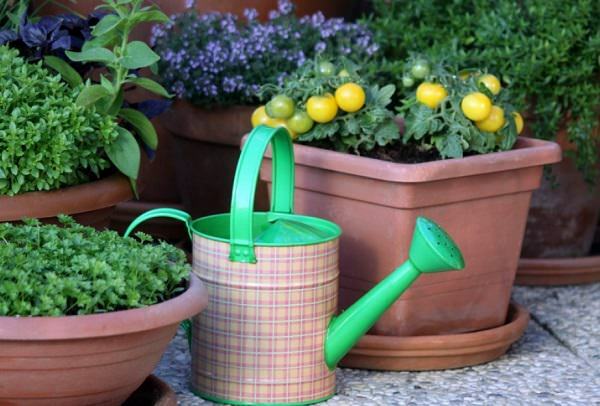 It is essential for growing vegetables in pots successfully! If it is windy, your planters will dry out quickly. Using self-watering containers is an excellent idea in that case. Once you’re done with everything mentioned above, it’s now time to gather pots for container vegetable garden that you’re planning to make. You’ll need to look at the variety of options– Standard pots, window boxes, grow bags, troughs, buckets, half barrels. 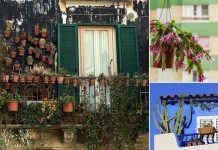 To grow things vertically– stacked planters, railing planters, hanging baskets and also some DIY planters! 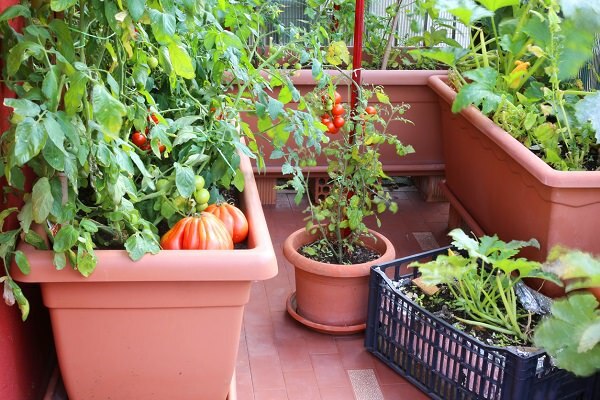 Don’t miss to read our article on Container Vegetable Garden Design Ideas to design your vegetable garden in containers. It depends on the type of vegetable (or its variety) you’re growing. For example, tomatoes can be grown in small to large sized containers (depending on the cultivar). For growing herbs, salad greens and vegetables like spinach, you don’t need large pots (6-8 inches deep is enough). Window boxes are suitable for them. Average 12 inches deep pots are readily available, and most of the vegetables like bell peppers, radishes, eggplants, okras adjust well in them. Tomatoes: If your container vegetable garden receives ample sunlight, try growing tomatoes. Pot size depends on the type of cultivar. Here’s a list of best tomato varieties for containers. Beans: Most of the beans are climbers or bushier type, and they grow upward. They are productive in pots and are easy to grow. You’ll need at least 12 inches deep pot (depends on the type) to grow them. Peppers and Chilies: Planting Bell Peppers in containers requires a pot that is at least 10-12 inches deep and wide. You can grow up to 2-3 plants (smaller varieties) in such a pot. For Chilies, you’ll need a large pot. Salad Greens: Growing salad greens in containers is an easy task. Choose 6-8 inches deep pot that is wide a lot. Lettuces, Asian Greens, Mustard Greens, and Arugula can be planted. You can keep these vegetables in part shade. Carrots and Radishes: Growing Carrots and Radishes in containers is a cinch. For Carrots, choose a pot that is 6-12 inches deep (depending on the type). For radishes, use a pot that is 6-8 inches deep. Cauliflower and Cabbage: For growing Cauliflower in a pot, choose a container that is 12 inches deep, you can grow one such plant in that. Pot size is similar for growing cabbage. Beets: This quick growing vegetable can be grown in 10-12 inches deep pot in a position that receives full sun to part shade. Zucchini: Zucchini is one of the most productive vegetables to grow in pots. Choose a container that is 12 inches deep. Herbs: Give space to herbs as well in your container vegetable garden. Most of the herbs can be grown in 6-12 inches deep pots. The main period to grow vegetables is from early spring to fall (autumn) and possibly in winter too, if you live in a warm climate or able to do a little more care of your plants by keeping them indoors or in a greenhouse. Either start seeds or buy transplants and seedlings from a nearby nursery. Buying plants is a good idea if you don’t have a green thumb. Here’s an informative article on growing vegetables from seeds to read! The potting soil is the most important thing of your container vegetable garden! Never use ordinary soil, use potting mixes made for containers or make yourself. Here’re two informative articles on the preparation of potting mixes– Visit BHG to read this one, visit Mother Earth News to read this one! 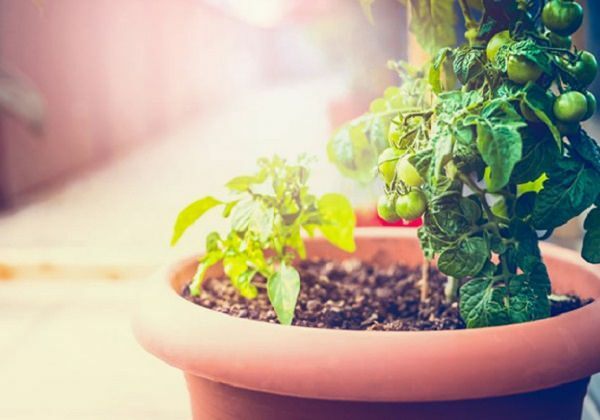 When growing vegetables in pots, be careful about watering as the plants may dry out quickly or else if you water them too much regularly they’ll die due to overwatering. While watering depends on the type of crop you’re growing, the one tip you can follow is to water only when top 1 inch surface of soil seems dry. Avoid doing this with the crops that prefer moist soil or if you’re in tropics. Plants growing in containers often suffer from nutrient deficiency. Applying general purpose liquid fertilizer (10-10-10) once in every other week is a great idea. You can also use time-based fertilizer. Avoid applying too much nitrogen to fruiting vegetables such as tomatoes and peppers. If you don’t want to use chemical fertilizers, use well-rotted manure. Use it in a 20-30% volume. If you’re growing vegetables in a really cool climate, keep your pots close to South or West facing wall. Keep an eye on pests, always check the underside of leaves to detect the pest infestation in time. I just read through this amazing container gardening piece and I must say its an eye opener . For a person who lives in an apartment like me ,I have a huge limitation when it comes to gardening .I could easily describe container gardening as a life saver . I have been trying to plant some cherry tomatoes in soilbags and I must say its working wonders for me .It was just an idea a friend put out and I went for it after trying to plant in pots with no success. Soil bags mean less work ,the weeding ,pruning goes out the window . The only problem has been making sure my plants get enough light and stay hydrated ,but with the new tip I just got (“self watering and or dripping ) I think I’ll be just fine .